Below is a 5-question test on finding the slope from a linear equation in general form. This test is linked to the lesson on finding the slope from a linear equation in general form, which also has a test. Finding the slope from a linear equation in general form What is slope of a line? The slope of a line is its steepness. It is how far up a line goes compared to how far across it goes. 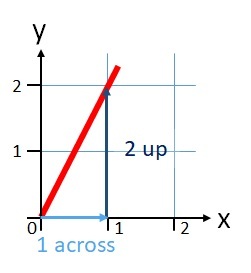 The line below has a slope of 2 because it goes up 2 units for every 1 unit it goes across.